Kyle Knits - a boy, his cats and way too much yarn: Spooky. Not much happening on the knitting front - still knitting away on a scarf for that ravelry scarf exchange project - hoping to get it done tonight actually :) - I'm planning some more knitting related stuff soon... but did get a good photo of Willow (left) and Winky (right) [in case there's any confusion which cat might have been named winky! HA!] -yes, she has only one eye... they don't normally lay near each other like this - so it was a rare kitty love moment! 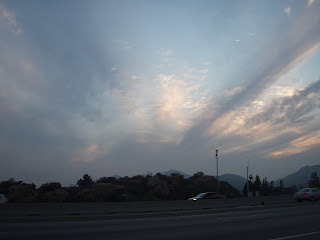 Here's a random "sunset" photo driving down the 118 near my house - I thought the sky was beautiful - aah, nothing more responsible than flying down the freeway at 70-80 mph snaping photos of the sunset... I noticed a few moments later that another guy was trying to take a photo of the same sunset with his cellphone... I guess I'm not the only nutcase in CA! with the same name as you..? would you charge me to make a pretty fuzzy scarf? Hi Kyle, I was going to write when I last visited. I knit in my spare time. Thanks for visiting my blog and letting me know you like my work. I have same email from my friends brother..He what to make a scarf for her girlfriends!! I know...It is so funny that how the blog is amazing...people will see your post and word to word knowing us form nowhere! The web of bloggers is omnipotent especially when knitting is concerned. I work knits at a dorm and people are constantly asking me how much I'd charge for things. So far this winter I've sold three hats but that's about it. 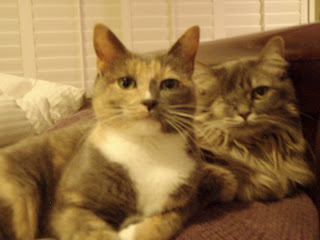 What a darling picture of your cats! Winky looks particularly mellow and loving. I love your cats! One day, I will tell the story of my one remaining cat and you will all be amazed! She has two eyes, but only half a tail and she's not even mine!